Reigns is a really fun and fairly simple mobile game. I've been playing it on iOS and I love it but it's also on steam and android. In it you are king and make decisions for your kingdom by swiping either left or right. You're given one choice at a time and every decision impacts one or more of the four pillars of your society. They're represented by bars at the top of your screen. If any of the bars gets all the way full or all the way empty your king will get killed. But then you get to start over with his heir and give it another try. I love the simple gameplay loop and the fact that every decision is a simple swipe left or right. This falls into the category of games that are definitely designed for a touch screen from the ground up, mobile is a perfect fit for it. 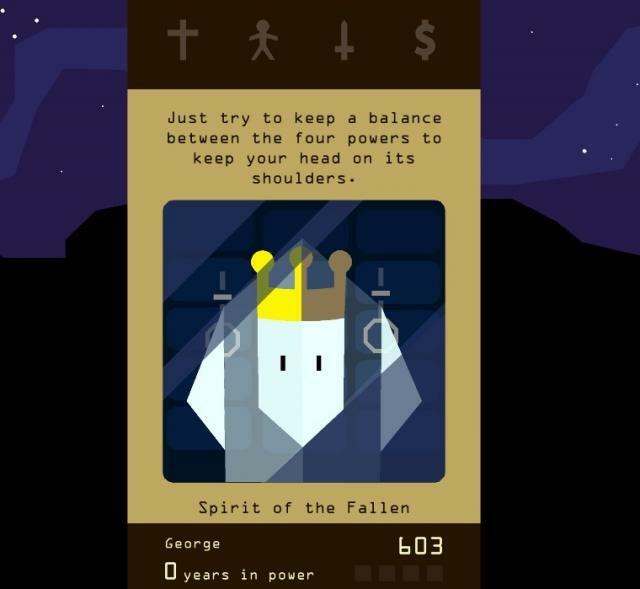 The other amazing thing about Reigns is that it's $3. I highly recommend you pick it up on your smartphone of choice.